If you know me then you’ll know that I always, always, ALWAYS have my nail painted – whether it’s a lovely natural look, crisp grey tones or beautiful berry shades, I always have a colour or treatment on them. As you can see in the photos, the packaging is relatively simple yet professional looking and in keeping with all other Nails Inc products. I love the style and look of these as they look so much better compared to traditional circular bottles, there’s a sleekness to them which makes them stand out. You all know by now that I like having all my products organised and these are great when you line them up in a drawer – I tend to organise my nail polishes in brand, colour and size order. This is something that brands are doing more and I love it – it just makes the overall bottle look so much better and the brush cap underneath is hidden too! The Nails Ins Gel Effect Polish gives you that ‘gel effect’ professional finish right in the comfort of your own home. Like I’ve mentioned above, I was kindly sent these products from Nails Inc to test and feature on here. 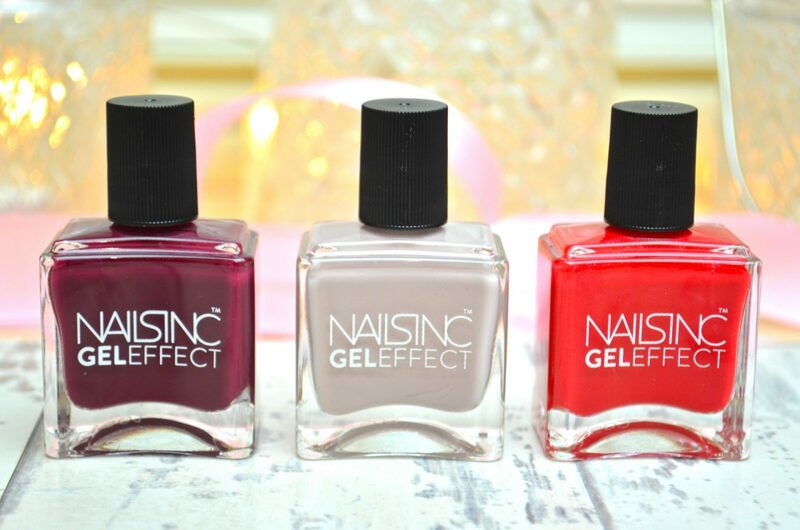 From the Gel Effect range, I’ve been sent these 3 colours plus there’s another one in the Nails Inc Candy Cane Set which I’ll be writing about very soon. All the colours are absolutely beautiful and perfect all year round! I would describe this as a creamy berry shade. In person it’s not as dark as it looks. It has a cream undertone making this a ‘sweet’ alternative compared to other contrasting dark tones. A beautiful grey-cream shade. This isn’t a harsh grey like some colours on the market and due to the cream undertone, this flatters all skin tones and looks gorgeous all year round. A chic go-to colour. Bold and Beautiful! This is a true red nail polish! If you’re looking for a red shade that will flatter all skin tones and catch people’s attention – this is for you! I normally change my nail polish every couple of days however when I’m testing a colour or range, then I’ll wear the colours for as long as they last. I’m slightly disappointed by the Nails Inc Gel Effect Polish range as I was expecting them to last a lot longer – without a top coat. The formulation has a new plasticiser technology which gives the colours a shine and hardness, like a professional manicure however without a top coat these colours lasted about a day until you could notice a few chips. With a top coat the colours last 2-3 days until noticeable chips started to appear – overall, not brilliant but if you’re like me and change your colour every couple of days this won’t bother you too much. I always like making things easy for you gorgeous readers so make sure you check out the following links. In the photo below, I’m wearing two coats of Kensington High Street (Berry Shade) with no top coat and as you can see, the shine is actually ok! Let me know what you all think about these gorgeous colours – are they something that you would use or do you prefer other colours?